In the early 1960�s the Louis Marx Toy Company of New York was fighting for continued dominance of the U.S. toy market. While their innovative, fairly expensive toys are well remembered (See the Big Red Toy Box Encyclopedia for �Marx Toys� by G. F. Ridenour), Marx also went strongly after the �dime store� trade. In 1963 Marx launched an inexpensive new line using the latest plastic technology that brought many, many dime store sales- the new six-inch soldiers. The �six inchers� incorporated much of the molding and style of the very small Marx play set figures and the boxed �Warriors of the World� series, even at times the same figures, but at six inches the new line could display a great deal of detail, at times too much for some buyers. One of the first series produced in the USA was the German World War II soldiers, and one of the original six was a threatening German with his bayonet pointing down, as if about to stab another soldier on the ground. This figure was quickly replaced with a bayoneting soldier in a straightforward stance. Obviously, all of these figures were not exactly six inches tall. The tallest was the Roman holding aloft a banner, totaling eight inches. The shortest was the prone US combat soldier, the top of his helmet a scant 1� inches high. Six inches is sort of an average height, and Marx did not give this line a formal name. In 1963 and 1964 (That�s MCMLXIII and MCMLXIV at Marx) Marx produced at least ten different series of six different soldiers in the United States. All were cast in soft plastic of solid colors. This �soft� plastic meant that small parts could bend just a little before they broke and that the figures would keep bite marks forever. The soldiers had no joints, no movement, and needed a lot of imagination to use. But at dime store prices as low as 7 cents, the kids of World War II veterans snapped them up, and backyards, sandboxes, and bedroom floors became the battlegrounds of the ages. Marx of Great Britain also produced a similar 1963-64 line, adding World War II British soldiers, World War I French soldiers, and a series of Scottish soldiers, some wearing kilts. These also were in sets of six, molded in soft plastic. However, these three series were not as realistic as the American production. Marx of Hong Kong took a different tack. Using the same production techniques as with the smaller Warriors of the World, Marx Hong Kong cast their sets in hard plastic and hand painted each individual soldier. These were most commonly sold as �GoldMarx� figures, and carried a premium price (sometimes as high as 49 cents in those pre-inflation dollars days). They were usually packaged in cellophane envelopes instead of the boxes of the Warriors. The Hong Kong GoldMarx Marines were the same as the US soft plastic marines, but in hard plastic and painted. But their Vikings, Germans, Japanese, knights, British, Roman, and Egyptians had no US or British counterparts. While the US cowboys were the same as four of the Hong Kong cowboys, two different figures were used in the GoldMarx line. The Hong Kong figures were detailed, but lacked the facial emotion of the USA creations. Some of these expressive USA figures saw other uses. 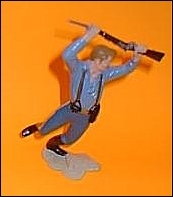 Soft plastic Japanese soldiers were packaged as targets with Marx dart guns. Soft Marines were packaged with big Marx US Army trucks, and a sitting soldier in multiples was produced to fill the backs of the trucks. The unpainted figures were also packaged with paints and brushes for a �do it yourself� completion project. Perhaps the most popular with artistic kids were the 1963 movie monster series, with the Creature from the Black Lagoon a favorite. My 14 year-old granddaughter still shivers at the Mummy. The details of many of these figures were amazing. One frontiersman had an arrow embedded in his shoulder, and his back was swollen with the arrowhead nearly breaking through. The dying cowboy�s gun barely touched the palm of his hand as he dropped it, and his hat was crumpled on edge at his feet. A knight had his visor open (but not hinged, so it is often broken). One GoldMarx Roman and three GoldMarx knights had removable weapons. Narrow bayonets, rifle slings, arrow points, single feathers, grimacing teeth, and individual fingers gave realistic details to these figures. A US Army veteran held my GoldMarx squatting marksman and told tales of being instructed to shoot in that exact position. Finding these figures in perfect condition is a real collector�s delight. Also in 1964 came the addition of two lines (eight figures in each) of girl figures to the Marx six inchers. Don Thompson�s excellent encyclopedia article on �Campus Cuties� covers that. In 1966 Marx produced the Man From U.N.C.L.E. series, including Illya Kuryakin, Napoleon Solo, Alexander Waverly, and three Thrush Agents, all based on a popular television show. A second series of Secret Agents came at the same time. 1967 brought the six figures of the Marvel Comics Super Heroes: the Incredible Hulk, Captain America, Ironman, Spiderman, Captain America, and Thor. These figures were of a slightly smaller scale than all the others, perhaps to denote their comic book origins. In 1970 Marx of the USA produced the last new series of six figures, the Moonwalkers/ Apollo Astronauts. In soft white (and later moonlight blue), these figures celebrated the 1969 walk on the moon, the greatest victory of the race to space. Production of some of the other figures continued through the years, including a marked line of US Marines in 1971. In the 1970�s, Quaker Oats purchased Marx Toy Company was sold to Quaker Oats and moved most of the molds and dies to Mexico. Bright plastics were used in reissued sets under the name PlastiMarx. Unmarked copies also show up on the market, some from Mexico and others from unknown sources. I even have one 7th Cavalry figure cast in bronze that includes the Marx imprint on the base. The painted GoldMarx/ Hong Kong sets present another dilemma to the collector. Should the unpainted USA and British figures be colored for better display? Or should the collector instead concentrate on examples of every color and shade employed by Marx and PlastiMarx? Some go one way and some the other without hard feelings, for modern paints are easily removed without damaging the plastic figures. My favorite? Perhaps the frontiersman swinging his long rifle by the barrel. Or maybe it�s the Egyptian with the half-circle arrowhead. Or perhaps it�s the knight with his removable helmet, or the Canadian radioman with his map spread across his knee, or . . . . Get the idea? 1963 Movie Monsters with Universal Pictures; later reproduced & unmarked. variation (warrior holding scalp high, replaced scalp with knife).